It’s Burns Night tomorrow, 25th January, a day to celebrate with a delicious haggis from north of the border. We have sourced ours from specialist producer Ramsay of Carluke in Lanarkshire, ‘The Chieftain of the Pudding Race’ prepared in a natural casing for your traditional Burns Supper or a tasty winter meal on any day. We are selling a 1lb ball haggis at £5.99, a great size for a starter for four people or a hearty main-meal for two to three. The best accompaniments would be buttery ‘bashed neeps’ (Scottish turnip = mashed swede), some mashed potato and fresh steamed greens, and a lovely warming nip of whisky! Tangy, sour Seville oranges are of course essential for making your own marmalade, but there are fantastic things you can do in the kitchen with just a few: they are in season right now, but not available for long. 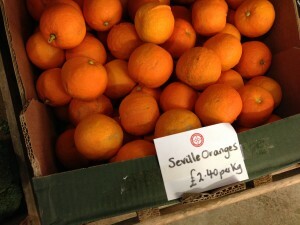 Think of them as punchy oranges with the sourness of lemons, and use both the zest and juice. For a while during their season, you can add their special flavour to liven up wintry dishes. Squeeze over winter salads, cook fish with them, make a Seville orange meringue pie, lemon pudding or drizzle cake using your favourite recipe. The simplest possible rabbit stew recipe, the ‘handful’ recipe is a traditional one which has been handed down from father to son, simple enough for the undomesticated. You lightly flour the jointed rabbit and put into a casserole with a handful each of chopped onion, carrot and celery (turnips are also good), some herbs, salt and pepper, and enough stock to almost cover, and a glass of wine or cider. Simmer until tender, about 2 hours. This is a perfect dish for the slow cooker, should you have one.